The Fall 2015 China Business Education Abroad class traveled to Beijing, Shanghai and Suzhou Oct. 8-18. Professors Ed Fenton, Burke Christensen and Siwei Gao accompanied the students as they visited a variety of companies, including KPMG, Zurich, Ogilvy & Mather, Caterpillar, AIA and CCCC LTD. At each company, the students learned about how businesses operate within China as well as globally. 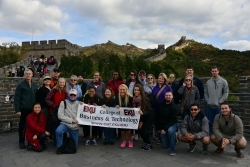 The EKU group also met with faculty and students from two Chinese universities: Peking University and Tsinghua University. In addition to the business and university visits, the contingent toured famous cultural sites such as The Great Wall, Forbidden City, Tiananmen Square, Summer Palace, the Temple of Heaven and the Jade Buddha Temple.